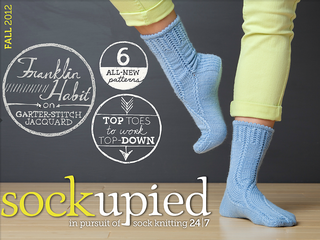 and 6 knitted sock patterns, the Fall 2012 Sockupied eMag is sure to keep your knitting needles busy and your feet cozy! --Forget fussy toes and heels! Work them flat, plain and simple with Candace Eisner Strick. --Learn 4 top-down toes from Kate Atherley. --Expand your stranded-knitting horizons with Franklin Habit’s colorful, rediscovered garter-stitch technique. --Go inside designer Chrissy Gardiner’s sock knitting Portland studio. 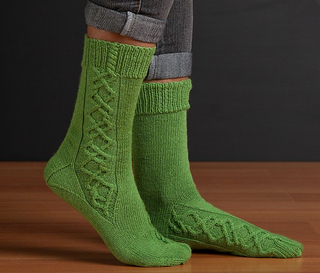 --And enjoy 6 sock knitting patterns from top-notch knitted sock designers. 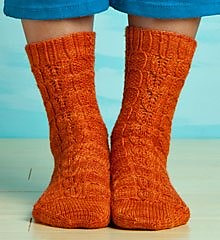 Sock patterns included in the Sockupied Fall 2012 eMag range from reversible gansey socks for men, cabled and textured socks, colorwork stockings, and even lace knitting designs. Plus, Sockupied Fall 2012 includes yarn reviews for reinforcement threads, notions to wrangle in your sock knitting, and reader stories of sock-knitting adventures. 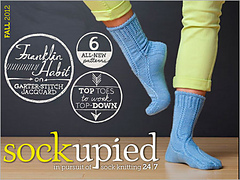 Download your copy of Sockupied Fall 2012 for fashionable sock knitting and valuable techniques!